After lots of trail and error, this cheesecake is perfect! One of the best desserts for people on the low-carb lifestyle is a cheesecake. It's so easy to make this dessert low-carb because pretty much all you have to do is substitute the sugar for an alternative sweetener. Cream cheese is low-carb as are most of the other ingredients in a good recipe. In fact, I shared this no-bake cheesecake recipe a few months back and it was pretty good. 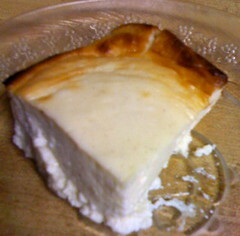 But there's something about a baked cheesecake that is so delicious I just had to create one. In Episode 43 and Episode 44 of "Livin' La Vida Low-Carb On YouTube," Christine and I show you step-by-step how we make this recipe in not just one but two videos. It took a while to get this to come out exactly like I wanted it, but this is pretty darn close to perfect. :) I hope you enjoy it! In a large mixing bowl pour the egg whites, cream of tartar and True Lime in it and beat with a mixer for 3-4 minutes until beyond frothy and thick. Add the heavy whipping cream and beat until thick again. Then add the erythritol or equivalent sweetener and whip into the mixture. Take the softened cream cheese and slowly incorporate it into the mixture with a low setting on your mixer until this gets really thick. Add 2 whole eggs and mix together. Throw in a dash of True Lemon, a dash of nutmeg, and a dash of cinnamon and beat into cheesecake batter. Carefully pour the cheesecake batter into a small non-stick pan sprayed with Pam and spread out evenly in the bottom of the pan. Place inside oven and bake for 25 minutes or until golden brown along the edges of the cheesecake. Allow to cool 45-60 minutes before slicing and preferably 4 hours of refrigeration for maximum thickness. Place a dollop of whipped cream on top for a low-carb dessert made in heaven! For those of us who can tolerate the extra carbs, could you tell me how much fresh lime (or concentrated) juice can be sub'd for the 8 True Lime packets? And what would the dash of True Lemon be in terms of fresh or concentrated lemon juice? Will substituting those items change the success of the recipe? Thanks so much! I really enjoyed both videos. Seeing the consistency and mixing progress (and what you mean by a "dash") was very helpful. Could you please tell us what size rectangular pan you used in the video? It looked like perhaps 12x10 to me but I wasn't sure. It's a small pan, about 6X9. But any small pan will do. So, how does Christine like being married to a blonde? Christine won't let me go bald. She says my head is too "bow headed." What's she talking about?! Is it possible to use a natural sweetener instead of artificial? What amount of say, honey or stevia be for this recipe? I'm not keen on anything artificial or sugar - but my husband really loves cheesecake! According to the company's website, 1 packet of True Lime is like one tablespoon (15 ml) of lime juice. According to wikipedia, erythritol is 60-70% as sweet as sugar, so 1/2 cup of erythritol would be equivalent to 1/3 cup of sugar. I'm gonna try out the recipe. I don't like things quite as sweet as the rest of Americans, so I may cut back on the sweetener a bit (although 1/3 cup sugar doesn't seem too sweet). Hi! I just hopped back onto the LC bandwagon (and hope I don't fall off again). I am thrilled to see your LC Key Lime Cheesecake. I am a great fan of True Lemon, True Lime, etc., and you have saved me some tinkering. Jimmy, what's the carb count/seriving size for this?